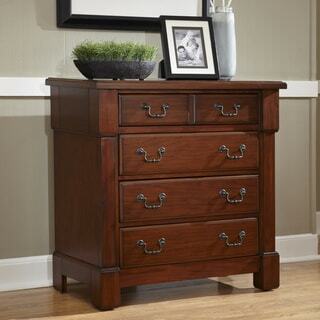 Create a distinguished focal point in your master bedroom with this Aspen Collection mahogany drawer chest. Carefully crafted from mahogany, its recessed picture frame moldings and rustic cherry finish provide a luxurious feel to the chest. The antique brassware on the shelves transports you back in time and adds sophistication to your bedroom. Make the most of the ample storage space available in the chest drawers. Each of the four drawers slide out on easy-glide suspension to ensure they do not stick. Store your valuable items, such as jewelry and delicate lingerie, in the felt-lined top drawer for added protection and easy accessibility. Note: This product will be shipped using Inside Home delivery. The product will be delivered to the nearest dry area (front door, garage, etc.) of your residence. Signature required upon delivery.